It's that time again for the Academy Awards telecast! A year has flown by so fast that Academy Awards Telecast No. 84 is just around the corner. Actually, it's on Sunday, 26 February 2012 and the fun begins at 7:00 PM ET with the Oscar pre-show followed by the Academy Awards Telecast at 8:30 PM ET, all on your nearest ABC affiliate. For us here in the Tampa/St. Petersburg area, it's on WFTS-TV (also known as ABC Action News) on Channels 11 and 1011 for those of us connected to Bright House Networks and over the air Channel 28 for the traditional over the air folks. Last year I put together a step by step diagram of the technical aspects of the Oscar telecast, especially the voice of the announcer when the announcer intones: The 84th Annual Academy Awards will return in a moment here on ABC. After all, when an Academy Awards telecast is around the corner we know who will be the host of the telecast plus who is going to present the various awards throughout the course of the telecast. However, the one aspect of the Academy Awards telecast that does not get a lot of mention is who is going to be behind the microphone in the announcer's booth as the announcer of that year's Oscar telecast. For the 84th Annual Academy Awards, it has been reported that Tom Kane will be returning for the announcing duties, according to this article in the Kansas City Star. (Here's another version of the article over at 913, Johnson County's (Kansas) News Magazine). However, Tom is going to get some help from a newcomer, making the Oscar telecast a co-announced telecast: Melissa Disney, who I understand this is her first time being the voice of an Oscar telecast. This year, I did something better based on my blog entry on the techical aspects of the Oscar telecast. 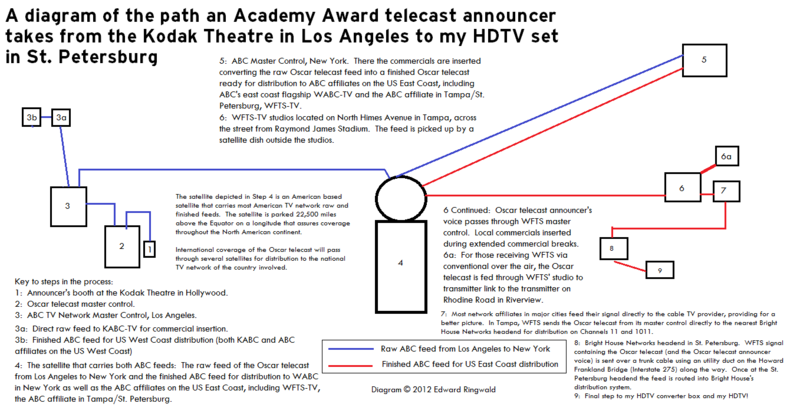 I put together a diagram of how an Oscar telecast announcer's voice travels from the Kodak Theater (now called Hollywood and Highland, due to Kodak being in Chapter 11 Bankruptcy and permission was recently granted by the bankruptcy court judge for Kodak to get out of the naming rights for the Kodak Theatre) in Hollywood to my HDTV set in St. Petersburg. What are you waiting for? Check out my diagram here. Or, you can view the PDF version here as well. As this is your second consecutive time announcing the Oscar telecast on ABC, your digitized voice will travel all over the place from the Kodak Theater in Hollywood to my HDTV set here in St. Petersburg. As such, enjoy the high speed digital voice over announcer ride, especially on Interstate 275 crossing the Howard Frankland Bridge (the segment on the Bright House Networks trunk cable from the Tampa headend to the St. Petersburg headend)! Speaking of the 84th Annual Academy Awards telecast, if you got a rant or two - either before, during or after the Oscar telecast - feel free to comment. Just be sure to keep the comments clean and family friendly for everyone! Since when your child's doctor became your child's legal guardian? Did I mention the Florida Department of Children and Families? Or the Florida Department of Complete Failure? They are supposed to protect our children from abuse and neglect but this agency will look to anything and everything to take your children away from you. If you ever discipline your children by spanking them (which I recommend that you please make a personal commitment to never spank your child) and it leaves marks on your child so much that your child's teacher sees them then DCF is called. Once you get that dreaded call from your child's school and once you have not only your child's school principal but a law enforcement officer and an investigator from DCF in that conference room at school and you are led out of the school in handcuffs on child abuse charges, welcome to a lifetime of harassment by the Florida DCF, even if the charges against you are later dropped. If your child's school is taking away your parental rights at the gate, such as the case at Virgil Mills Elementary School just outside of Ellenton, Florida (east of the southern terminus of Interstate 275 at Interstate 75), just think what your child's doctor or pediatrician is doing. As a parent, you have the right to make reasonable medical decisions for your children. Since when does your child's doctor started making the decisions for you? Many of you out there have been following the story on Bay News 9 where Florida Highway Patrol Trooper Dan Cole had a suspect in his custody. The suspect, 20 year old Danielle Maudsley, was being arrested on charges of leaving the scene of an accident and driving while license suspended or revoked. NOTE: It should be noted that I do not condone what Danielle Maudsley did. However, this blog entry is based on how the arrest by Trooper Dan Cole was handled. During processing, the suspect attempted to flee from the Florida Highway Patrol station in Pinellas Park. Trooper Cole discharged his Taser device on Danielle Maudsley, causing her to fall to the ground, which led to a series of events rendering Danielle in a vegetative state. An internal affairs investigation conducted by the Florida Highway Patrol into Trooper Cole’s actions plus an independent investigation conducted by the Florida Department of Law Enforcement recently cleared Trooper Cole of any wrongdoing. There is dashcam video of what happened in the cruiser and what happened at the station which can be viewed at Bay News 9. I watched the video on Bay News 9 for myself. While many of you think that Trooper Cole was justified in his actions, to me this is gross conduct unbecoming a member of the Florida Highway Patrol in my book. As I watched the video on Bay News 9, here are some key points that I feel Trooper Dan Cole mishandled when Danielle Maudsley was arrested. 1. When a suspect is placed under arrest, the policies of every law enforcement agency, including the Florida Highway Patrol, mandate the application of handcuffs upon the suspect, double locked and placed behind the back. Minor exceptions can be made depending on the suspect's condition and the likelihood of escape based on the charges. During training in the law enforcement academy, recruits are instructed in the application of handcuffs in a manner that does not cause injury to the suspect being arrested. Ordinary regulation police handcuffs – whether they are chain or hinge connected – are kept in readiness until the time comes for their use. Handcuffs are placed on the wrists of the suspect by pressing down on the ratchet bar gently on the wrist and allowing the ratchet bar to lock within the handcuffs’ locking mechanism. This is what is called single locking. After both cuffs are applied onto both wrists, the cuffs are checked for proper fit using a standard universal handcuff key kept by the officer. While maintaining control of the suspect, the ratchet bar is adjusted for a comfortable yet secure fit; this is important due to the distance the officer must travel with the suspect, usually from the location of the arrest to the county jail or detention facility. In Danielle Maudsley’s case, it is believed that her wrists may have been so small that she somehow managed to get out of one of the cuffs. In order to counteract this situation, a piece of plastic that affixes onto the cuffs – called handcuff helpers – is fixed onto the rigid part of the cuff to prevent any form of escape. After the handcuffs are checked for comfortable yet secure fit, then the officer will lock the cuffs a second time using the tip of the handcuff key pressed down into a notch on top of the handcuffs locking mechanism. This is called double locking, and doing so prevents any travel of the ratchet bar in any direction. At this point the suspect can be safely placed in the police cruiser for transport to the county jail for booking. Once in the secure confines of the booking area of the county jail, either the arresting officer or detention deputies will remove the handcuffs. 2. Once under arrest, the suspect is supposed to be taken from the place of arrest to the county jail or detention facility that has jurisdiction in the area. In Pinellas County, anyone arrested is taken to the Pinellas County Jail located on the campus of the Criminal Justice Center complex on 49 St N in Clearwater, while in Hillsborough County anyone arrested there is taken to the main Hillsborough County Jail on Orient Road in Tampa. County jails – especially their booking facilities – provide maximum security to enable inmate booking and processing while at the same time the arresting officer can devote his or her time to completing the necessary paperwork including citations and arrest/incident reports. Instead of taking Danielle Maudsley from the place of arrest direct to the Pinellas County Jail, Trooper Dan Cole takes Ms. Maudsley to the Florida Highway Patrol station located on US 19 north of Gandy Blvd. in Pinellas Park. Many older police facilities either do not have holding areas for suspects or have had their holding areas demolished and refurbished into other law enforcement uses, as is the case with the St. Petersburg Police Department in which the old city jail was turned into a communications center. What Trooper Dan Cole should have done was to transport Danielle Maudsley directly from the place of arrest to the Pinellas County Jail. There Danielle would have been processed and booked like any other inmate coming into the jail while at the same time providing security to prevent any escape. While there, Trooper Cole could have completed his paperwork - such as the citations for leaving the scene of an accident and driving on a suspended license as well as the offense/incident report and the criminal report affidavit - right there at the jail. 3. In controlling the suspect, the Florida Department of Law Enforcement has a matrix of the proper use of force to be applied depending on the situation at hand. It is believed that while Danielle Maudsley was in the FHP station along with Trooper Dan Cole, Danielle was not secured properly enabling her to escape at the right moment. In order to prevent Danielle from getting away, Trooper Cole decides that the best solution was to deploy the taser weapon. However, Florida Highway Patrol procedures do not justify the use of the taser on a suspect that is just fleeing; if Danielle became aggressive at Trooper Cole to the point that physical harm was imminent then the use of the taser would have been appropriate. As I have seen in the video, it was demonstrated that Trooper Cole did not maintain adequate control over Danielle Maudsley during the period of custody, especially while in the FHP station. Furthermore, seeing how Trooper Cole discharged his taser is more typical of police and security forces in countries where human rights and civil liberties are not respected such as China, North Korea, Cuba or even Belarus. Based on Danielle’s physical condition at the time of the arrest, upon impact by the taser a series of events began that led to Danielle falling down to the asphalt pavement striking her head upon impact. The turn of events rendered Danielle unconscious and has what resulted in Danielle being in a vegetative state with a poor prognosis, according to Bay News 9. In fact, the way that Trooper Dan Cole used the taser on Danielle Maudsley raised a lot of questions, according to this St. Petersburg Times article. First, Trooper Dan Cole mishandled the arrest of Danielle Maudsley by not checking the proper fit of the handcuffs for transport and not taking her directly to the Pinellas County Jail. Instead, Trooper Cole decides to take Danielle to the FHP station where there is minimal to no security for arrested individuals while paperwork is completed. Second, Trooper Cole should have enlisted the aid of another trooper in the station when Danielle Maudsley attempted to flee. As such, two troopers could have stopped Danielle from fleeing and going any further without resorting to the use of the taser. Third, Trooper Cole was verbally abusive with Danielle throughout the entire process as was seen in the Bay News 9 video. Imagine for a moment: If Trooper Dan Cole treats any member of the public in any aggressive manner I think he treats anyone that he pulls over on Interstate 275 as part of a traffic stop. Trooper Dan Cole’s actions are clearly a disgrace, not only to the Florida Highway Patrol and his fellow troopers in Troop C but to the law enforcement profession as well. Trooper Dan Cole’s decision to use a taser on a young woman was uncalled for. Other than the fact that she was fleeing, Danielle Maudsley’s actions did not pose any threat to Trooper Dan Cole. Trooper Dan Cole clearly violated the procedures of the Florida Highway Patrol when it comes to the use of the taser weapon. Trooper Cole did not give any warning to Danielle Maudsley before the taser was deployed. The proper procedure is the verbal warning of “Stop! Taser! Taser! Taser!” before the taser weapon is fired. Moreover, Trooper Dan Cole had the assistance of other troopers at his disposal while at the FHP station in Pinellas Park. When Danielle Maudsley fled the FHP station, Trooper Cole had the opportunity to physically capture Danielle in a safe yet secure manner. Instead, Trooper Cole decided on his own initiative to use the taser weapon without any regard for the safety of the suspect in custody. (After all, the Florida Highway Patrol has policies regarding taser use). Because of Trooper Dan Cole’s reckless and wanton actions in capturing a fleeing suspect which posed no danger whatsoever, Danielle Maudsley is in a rehabilitation center in Ft. Lauderdale, being assisted by life support machines. From what I found out on Bay News 9, the prognosis for Danielle is not good according to the doctors. Also due to Trooper Dan Cole’s actions, Danielle Maudsley’s mother is looking at medical bills which are reported to be in the seven figure category. The way you handled Danielle Maudsley’s arrest on the leaving the scene of an accident and driving on a suspended license was way out of line. You mishandled the arrest right from the time you placed Danielle under arrest with the improper placement of the handcuffs. You knew better when you decided to use the taser. According to the same St. Petersburg Times article I mentioned earlier, you joined the Florida Highway Patrol in 1998 and you were awarded Trooper of the Year for the Pinellas Park division in 2000. In that same article the last time you used the taser was in 2009 to save a man from jumping off the Sunshine Skyway Bridge; I believe your use of the taser was in a safe manner as you had other troopers assisting you. I know a good majority of police procedures because I went to a citizen’s police academy in 2004. You should understand what Danielle Maudsley's mother is going through right now, planning for the worst. No mother should not have to go through the potential of having to plan a funeral for her child at the most critical hour. So please, do yourself, the Florida Highway Patrol and your fellow troopers in Troop C, and the general public - especially motorists on Interstate 275 in the St. Petersburg area - a favor: Step down from the force. If you ever had an encounter with Florida Highway Patrol Trooper Dan Cole - especially a negative encounter such as if you were subjected to verbal abuse during a traffic stop for example - I invite you to please post your experience here. Just a reminder: All comments are moderated (when you click on the post your comment button you will not see your comment right away) and are subject to my approval before it appears here. As always, all commenting on my blogs are subject to the Community Guidelines, so you may want to review them from time to time.